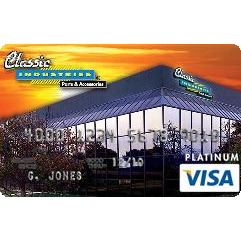 Receive up to 15% off orders from Classic Industries. Earn points at hundreds of online and neighbourhood retailers plus bonus points at select merchants. Redeem your points for travel, merchandise and more. 3% of the amount of the Cash Advance, with a $15 minimum and a $50 maximum. 13.99% to 17.99% based on your creditworthiness.